Weaving straw by hand and selling the products in this organized marketplace is one of the country's oldest industries. Although the Bahamians have been using dried leaves from palm trees and sisal plants to weave baskets and other items since the 1700's, it was not until the mid 1940's when it became an organized industry. 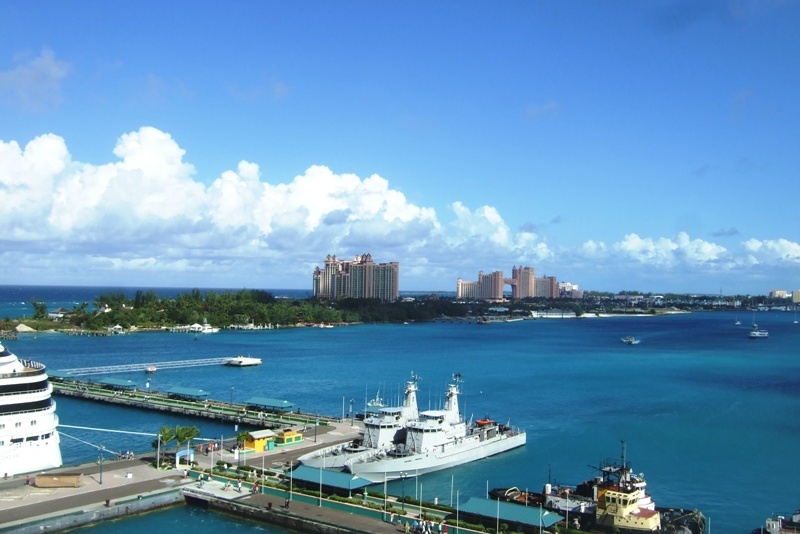 Today it is a major business not only in Nassau but other islands in the Bahamas chain. 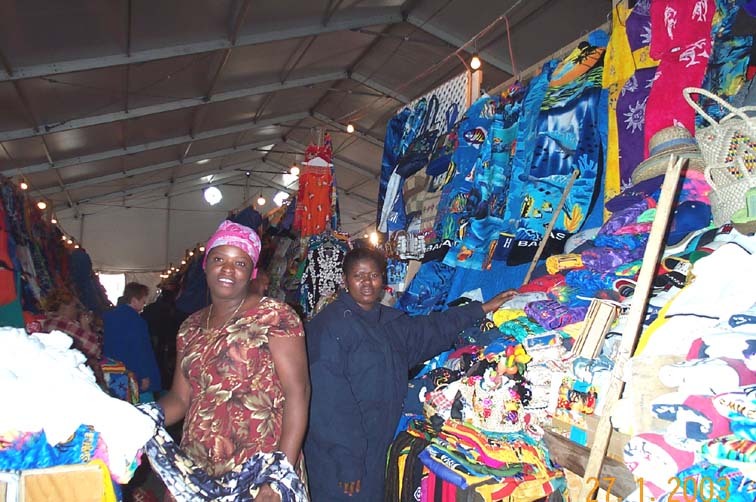 Some of the items sold here can be tacky, like a wallet made out of pink straw with the words Nassau or Bahamas, weaved into it in green straw, yet a visit to Nassau doesn't really seem complete without a visit to the Straw Market. I always enjoy watching the local women and some men weaving their straw and usually they are happy to let you take a photo while they are working their craft. If you take the time to look around you may find a sleeping baby behind some of the displays, or a toddler holding on to her mamma's dress. These ladies work here all day while the market is open from 9 to 5 and they even eat their lunch while they work. This is definitely a place where you are expected to bargain with the vendors, and if you purchase several items you can always count on a discount. The Bahamians are happy and not too bad with high pressure tactics. They all know each other and if they don't have what you want they will guide you to one of their friends' stalls nearby who will most assuredly have it or make it for you on the spot. 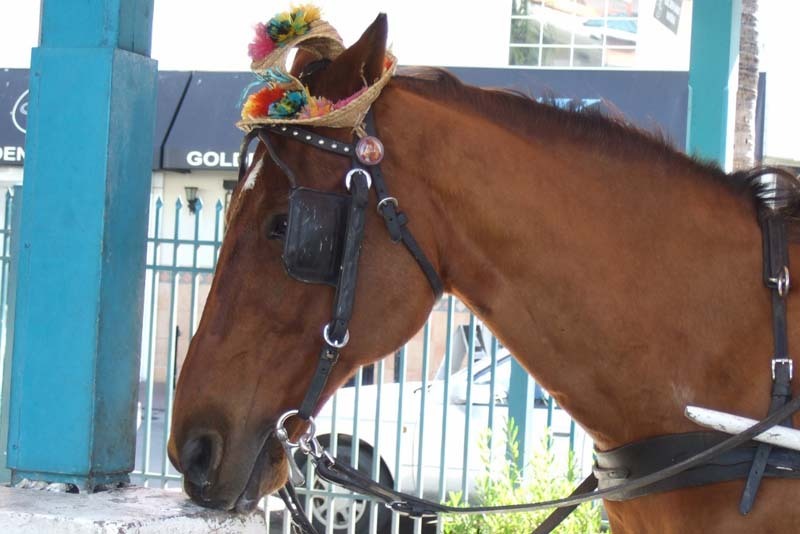 Even the horses that pull the tourist carriages are adorned in straw hats from this market. It is all part of the atmosphere here. The items can range from straw hats to beach bags to belts to puppets and dolls made from straw. The vendors sell clothing (not made from straw) here as well, for both adults and children. Some of the stalls even have fitting rooms to accommodate the millions of tourists who visit here. Hair braiding is available here as well as other souvenirs made of wood and shells. Some of my favorite items are the Christmas ornaments made from seashells. Fire damaged the straw market in 1974 and again in 2001. A makeshift temporary Straw Market under a large tent is the one I have shopped at on Bay Street. In August of 2011, the Straw Market was badly damaged by flooding after Hurricane Irene and was moved to an area near Prince George Wharf. In early December of the same year another fire destroyed the rest of the Straw Market. Two weeks later a brand new and improved Straw Market opened on Bay Street and I am looking forward to seeing it on my next cruise. With space for 500 vendors the new Straw Market consists of two levels of air-conditioned space, with the first level covering 37,000 square feet and 4500 sq ft on the mezzanine level. Built to withstand winds up to 200 miles per hour, this 12 million dollar structure should last forever. Public washrooms, an ATM machine and Wi-Fi technology are available here so the vendors can take credit cards. For fire safety an overhead sprinkler system has been installed and the building is equipped with a generator. On your next stop in Nassau, enjoy the new Straw Market in air conditioned comfort and see if they still make the pink wallets. As the locals say, "it's better in the Bahamas."